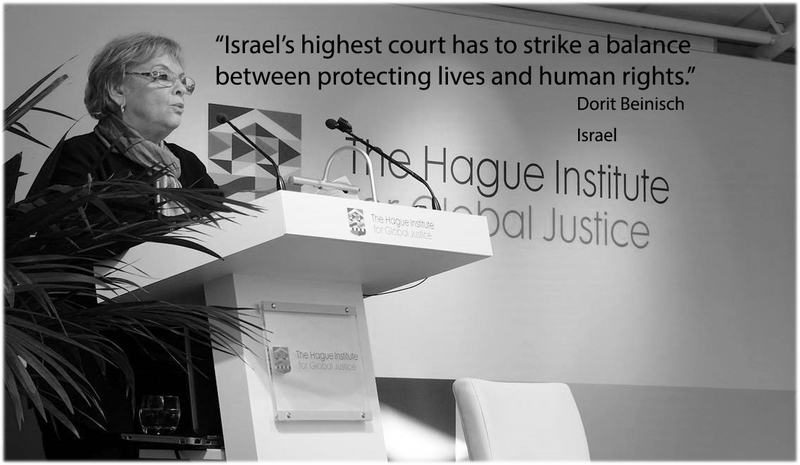 In 2006, Dorit Beinisch became the first woman to be named as president of the Israeli Supreme Court (Chief Justice). As a justice, Beinisch has ruled in numerous cases relating to human rights, minority rights, terrorism and national security, and strived to stress, in her decisions, the importance of the rights of women, children and the weak in society. This is the first in a series of My Justices in the run-up to Palestine’s formal accession to the International Criminal Court on April 1. “I’d like to share with you our values, the problems we deal with and how the Israeli Supreme Court works. We are the highest court in the country. We deal with civil and criminal appeals, and we are a court of judicial review on administrative and constitutional acts. We deal with all kinds of cases. But what is special and well known is our special review system. Our court has the power of judicial review regarding civil, government and military decisions. And in recent years, judicial review of the legislation has also been included. That may be difficult to explain because we don’t have a full constitution, but we have basic laws. These basic laws are chapters of our constitution, in which basic human rights are enshrined. The court has the power to review legislation in accordance with these basic laws. “Our power is not always accepted by politicians. No one likes to be reviewed or criticised. This is why some say we are an activist court. I don’t know if that’s really a true label or not. But in many aspects, we are active. “In cases of judicial review, everyone has direct access to our court. We do not demand the right of standing. On matters of national security, the Supreme Court is the first and last instance. You can go directly to the court and ask for a judicial remedy. “We manage to do our work, though the conditions are not easy because so many issues come to the court. We are overloaded. “We play a role in the fight against terror, a fight in which we all share the same concerns. Western democratic states have prepared new responses to terror, and Israel is no exception. Since 2000, a very serious style of terrorism has flooded the country. Terror against innocent families, women and children. There was a time when Israel was really suffering from suicide bombers. It endangered the population. There were a few years when it was even dangerous to enter a bus or a restaurant. Later, terror changed its methods to missiles and rocket attacks. “We still have very serious terror attacks. The questions are: how do we face them and how do we balance the needs of a democracy that is fighting terrorism? Maybe our court, more than any other court in the world, has to deal with these issues. 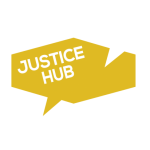 We have to adjudicate on cases – sometimes on a daily basis, over years and years, in hundreds if not thousands of cases – and to strike a balance between the needs for security and protecting human rights. We emphasised that Israel’s highest court had to strike that balance and those interests: both protecting lives and human rights. Deciding on the proportionality of measures to be adopted by Israel is hardly an easy task. In times of war or emergency, the public demands security. After an attack, there is always a demand from politicians to react. “But, of course, I think the advantage of the courts is that we are not dependent on votes. We have to consider the problems in a different way than the government. The government does not always view us favourably. Not everyone really likes it. Some claim that the court impairs the government’s ability to fight terrorism. ‘You limit us. We can’t work like that’, they say. “We all know that international conventions were created in response to the atrocities of World War 2. But I think we all know that no one predicted the fight we have now: the fight against terrorism. That is a different war than between military armies with uniforms, so different. When we try to comply with the norms of international law, we try to adapt the system of international norms to the situation of today. “Given its complex nature, terrorism places new challenges on the court to balance the protection of human rights, the rule of law and security. Courts today are faced with the question of whether they should take cases related to national security. Not everyone accepts that courts should play that role. I believe we do, and we should examine situations in light of the principles of international law. How to interpret it to fit with today’s events – those are dilemmas are facing. When fighting terrorism, the line between peacetime and war is very thin. But the law is the law, whether it is peace or war. The specific balancing point may change, of course. “We judges are not experts in the effective methods of how to fight terrorism. We are not experts in military operations. We are not army commanders nor academics. We are judges, and we are experts in assessing whether the means are legal, whether they are proportional, whether they fall within the margin of appreciation. I believe that we specialise in determining whether a law, a government policy or a military action is consistent with our basic laws and with our fundamental values and principles. I also believe that my fellow judges in Israel and elsewhere in every democratic system make these decisions according to our conscience and to our best legal understanding of the limitations of a democracy. “Consider almost any issue raised by the fight against terrorism, and I will tell you the Israeli Supreme Court has probably dealt with it already. The illegality of the use of torture – this was one of the first decisions of 1999. Since then, the security services’ methods of interrogation have had to change. Detention – right to counsel, the illegality of a secret detention facility, deportation and relocation of terrorists – is it legal or not? “Here we also had the advisory decision of the International Court of Justice. They called it a wall. We call it a fence to stop terrorists from coming through. We have dealt with about 140 or 150 cases regarding the legality of the fence. Not theoretically but practically, on every kilometre. The Palestinians challenged it and so did NGOs. “It was brought before the court, and we accepted the argument of the state that it is a form of self-defence of the country. We accepted this argument from the military, but we demanded that the military take less land, less private property from the protected inhabitants. We changed the course of the fence to limit the military commanders to only what is really necessary. “How do we do it? What tools do we use? We have five principles: the first is broad access to the court. Anyone can approach the court. This is a very important tool. Secondly the court never accepts the state’s arguments of non-justiciability, meaning we do not accept that we should leave it up to the executive or the military to decide. The norm is that matters are justiciable. Thirdly, when necessary, judicial review is in real time and not retroactive. The court takes cases immediately. Fourth, international law is both a substantive element and a guide. And fifthly, the court is the highest in the state. “Deciding which international law conventions apply is part of our decisions. Customary law is part of our system. For example, the West Bank territories are kept by Israel under the law of occupation from the legal point of view. They were never annexed, and therefore humanitarian law – the principals of the Fourth Geneva Convention – are part of what applies in the territories. “Maybe I can illustrate those principles using the most extreme example. After we had missile attacks on Israeli cities in 2008, Israel launched a military operation in Gaza. Just as it started, some petitions were filed by human rights organisations supported by people from Gaza. The petitioner himself came from Gaza. I don’t know how. He was in the court. They alleged violations by the Israeli Defence Forces on restricting the access of medical personnel and ambulances. There was another petition claiming a shortage of electricity, which allegedly prevented hospitals and clinics from operating and people getting water. The military said they know the duties to allow access and to give way for ambulances. But they claimed that there was a problem when ambulances were being used to hide terrorists.